If you are designing your own wedding dress no doubt you need to find a source for wedding gown patterns. You may be looking for a pattern that looks similar to a style you saw in a bridal magazine or when shopping for your gown. Where should you look for patterns? One place to look for bridal dress patterns would be your local fabric store. But before choosing a pattern for your wedding dress, you need to determine which wedding gown styles will look best on you. The best way to do this would be to go and try on gowns at the bridal salon. After determining what styles look best on you, get pictures of the styles you tried on to take to the fabric store to see if there are bridal gown patterns that will match. I the fabric stores you will find commercial patterns pictured in "pattern books." Once you find a pattern you would note the pattern number and then pull it from the pattern filing cabinet drawer. The main pattern books you will find in fabric stores are McCalls, Butterick, Simplicity and Vogue. Just turn to the bridal /evening section of the pattern books to find a selection of wedding dresses. While you are at the fabric store, take a look at the wedding dress fabrics to familiarize yourself with what is available. If you are making your own gown... it will be easier for you to probably pick a gown and follow the pattern exactly. Sometimes you can mix and match the pattern pieces. You can change the sleeves or details by interchanging pieces from one pattern to another. If you are using a dressmaker to make your gown... you should consult with the dressmaker before buying any fabric. Take your pattern to her and she will let you know what fabrics, notions and trims you need to purchase. She will also let you know what changes can be made to the pattern design. Some wedding dressmakers have the ability to draft their own patterns. You can take a picture to them and they can make a gown from the picture according to your measurements. If you find a sewing professional who can do this, you can definitely get your perfect wedding dress. "If you can sew pretty well, but don't possess pattern making skils, you may want to get a bridal dressmaker to design and make the pattern for you." You have to be very advanced in your sewing skills because there will, in most cases, be no instruction sheet to tell you how to put the gown together provided. You will have to already know how to construct a gown. If you have made several evening gowns this will not be too much of a problem. There are some sources for wedding dress patterns online. You can find the big four pattern companies patterns-- Butterick, Simplicity, Vogue and McCalls. Simplicity has a few wedding gown patterns under its' New Look special occasion patterns. Don't forget to check out the evening gown patterns. You can transform those patterns into a beautiful wedding gown. Especially if you are having an informal wedding or beach wedding and don't want a train. There is a design company called www.weddingpatterns.com that have their own stock patterns of wedding gown patterns they design and sell. They have models in the actual gowns so you can see what they look like. The prices are a lot higher than what you find from the commercial pattern companies. But you have more modern styles to choose from. If you are looking for vintage wedding dress pattern, then www.betsyvintage.com, is a source you might want to try. They carry a large selection patterns from the 1930's to the 1980's. 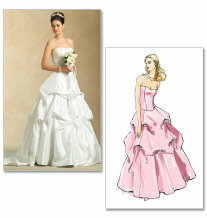 You can also check out bridal gown patterns here on Ebay . If you are sewing the gown yourself... determine your size by measuring yourself. Look at the back of the envelope to find out what the suggested wedding dress fabrics are and the yardage you need for your size. Get all linings, trim and notions. Next you will need to read through the guide sheet thoroughly. Go over the layout. Now cut your pattern pieces apart. Make any pattern adjustments now for length and width by comparing your measurements in key areas with the pattern. This may mean you need to add more paper to your pattern or fold out the excess to make adjustments. Once you make the adjustments to the wedding gown pattern, you can cut the gown. I always suggest making a sample gown first out of muslin fabric or a cheap fabric, before cutting your wedding gown fabric. This way you can make adjustments when fitting the sample gown. Now that you have made changes to the sample gown, you can transfer these to the original pattern or take the sample gown apart and use it as your wedding dress pattern to cut your wedding gown fabric. If you are using a local dressmaker... she will measure you and then go through the steps outlined above to make you a wedding gown pattern. Then you should have a sample dress made in whole of in part for a fitting. Then a fitting in the gown before it is constructed completely. Now some dressmakers don't make a sample gown. But at the very least you should have a fitting in the gown before it is completely sewn. Discuss the process up front with your dressmaker. If she doesn't do any fittings, I would look for someone else.